That’s a blue dasher (Pachydiplax longipennis) and it is a largely unremarkable dragonfly inasmuch as it’s incredibly common in the US. 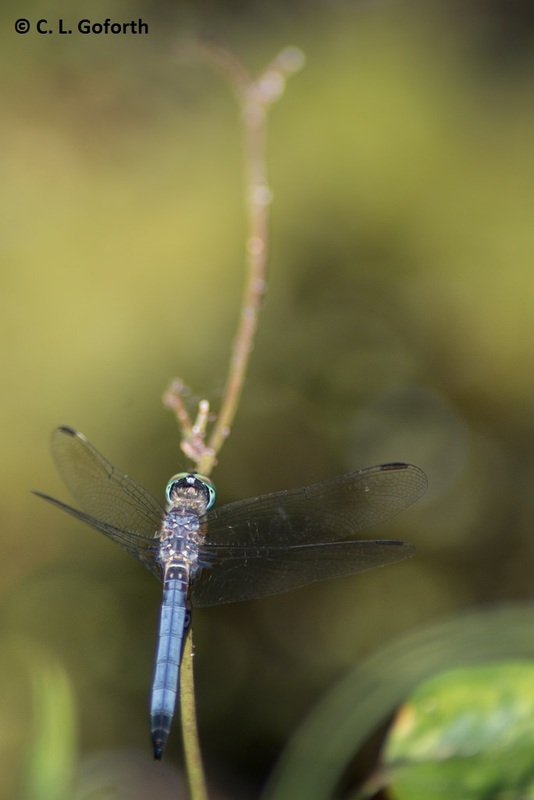 However, the particular blue dasher in the photo was a part of something exciting and stands out in my memory as being wonderfully interesting. Allow me to elaborate. Last summer, I attended Bug Shot 2014 on Sapelo Island in Georgia. It was, as on past trips, a great weekend full of insect nerdery, endless photography, and a lot of great conversations with good people. I really love attending Bug Shot as the people there are my kind of people and we have this one huge thing in common: a deep and pervasive love for photographing insects. However, because I’d been twice already and was attending after a rather brutal week at work, I was exhausted and skipped a few of the sessions on the last day to get a little time to myself. I wandered over to the pond to look for dragonflies and attempt to get some photos of the many whirligig beetles on the surface. Now, Sapelo Island has some dangerous things you need to look out for, and alligators are among them. I adore alligators. They scare me and I give them a ton of respect when I see them – I have zero desire to get close to them! – but I really love them. They are just so ancient and powerful that it’s hard not to love them. When I heard there were several alligators in the pond on Sapelo, I had to go looking for them. I failed to see them most of the second day, but I finally saw the two adults out in the pond on that last day and was thrilled. So, imagine my excitement when I was photographing that unremarkable dragonfly at a different area of the pond 10 minutes later and noticed a small, juvenile alligator swimming by, just a few feet from where I was standing on shore. ate the dragonfly in the photo above! One moment the dragonfly was there and the next it was in the belly of an alligator! Suzanne and I both yelled, “Whoa!! !” and started excitedly asking one another if we’d seen really just seen what we thought we did. If I had been alone, I wouldn’t have been convinced that the alligator had actually swallowed the dragonfly, that it had just scared it off, but Suzanne confirmed that we had, in fact, just seen a 3 foot long alligator launch itself out of the water, snag a dragonfly from a perch two feet above the water line, and swim quickly away, hidden by a plume of mud the quick motion had stirred up. Coolest. Thing. EVER! As much as I love about and learn at Bug Shot every time I’ve attended, I suspect that one observation is going to stand out in my mind as the very best thing I’ll ever experience at Bug Shot. It represented new information for me: that alligators will occasionally eat dragonflies, even if they’re a couple of feet above the water line, which means that dragonflies are a significant enough food source to merit the speed and power it requires for an alligator to catch one. It was fascinating to watch two ancient creatures interact, alligator and dragonfly, and see just how fast and powerful alligators really are. What an amazing story. Dragonflies can be fearsome predators, but this is a reminder that there are other predators higher up on the food chain. Glad you liked it! I thought it was AMAZING! Was so thrilled to have seen that. So glad you liked it! I was SO happy to see that! Wow!—Never would have guessed an alligator would go after a Dragonfly—Thanks for telling us the story. Me neither! Would have thought that wouldn’t have been big enough to be worth it – more a snack than a meal! I didn’t realize they ate bugs! That’s great that you got to see it, albeit it a bit scary. My husband played golf at Disney years ago and an alligator was at the edge of the course. He accidentally hit a ball too close and decided he didn’t really need that ball anymore. One of the guys he was with started teasing the alligator with some tees and my husband pointed out that alligators moved pretty darn fast and they needed to get out of there before something happened. That was probably the best thing you hubby could have done! I was shocked when I went to the Everglades several years ago that people would walk right up to the gators, sometimes even touch them, without a thought. Those things are crazy powerful and fast and I have zero desire to be on the receiving end of those teeth! Still, I am SO happy I got to see the gator go after the dragonfly. That was pretty close to his comment too that he was surprised people were so careless around them. Are we one of the few to watch Animal Planet?? ?